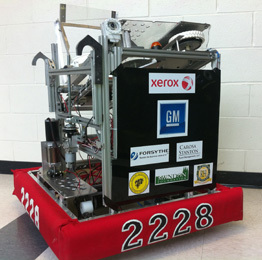 Team 2228 began operating in 2006, after several years of preparation by community members. This group advocated for the implementation of a FIRST program by promoting regional competitions, the various FIRST divisions, and STEM. To raise interest, the technology teachers and mentors recruited students and administrators to attend the FRC Finger Lakes Regional at the Rochester Institute of Technology. 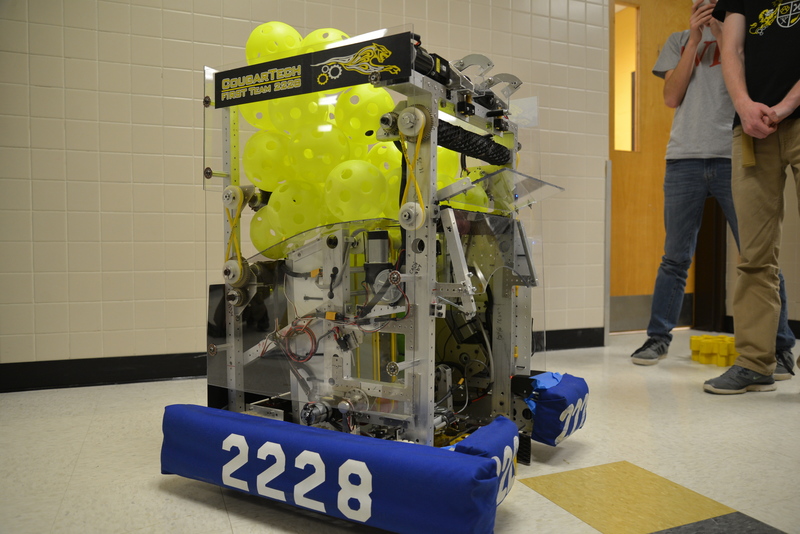 Energized by the spirit and energy of the competition, Team 2228 CougarTech officially became a part of FIRST. In our first years, Alstom Transport supported the team financially while the Honeoye Falls-Lima School District provided advisors, a place to work, and support of our curriculum goals. Over the years, we have learned the logistics of running a competitive team. 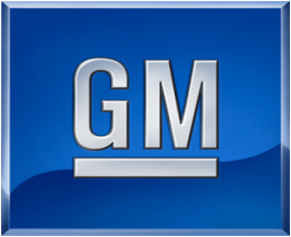 Our sponsors now include Forsythe Technology, Xerox Corporation, and many local firms such as GM and QVI. We've earned a NASA grant, and become affiliated with The Mendon Foundation which has helped us to continue through rough financial times. Team 2228 is an organization lead and defined by students. Our team leads and sub-team leads are elected democratically, devise strategic goals, and facilitate throughout the build and off seasons. 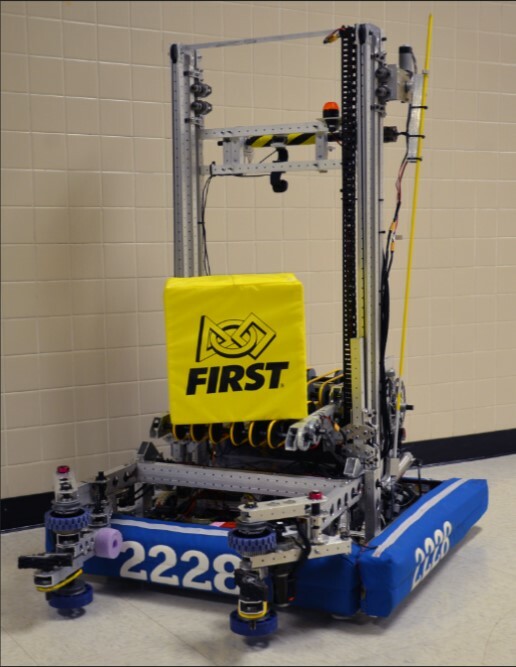 In addition to technical skills, Team 2228 emphasizes proficiency in business, leadership, teamwork, and project management. The majority of our graduates enter science, technology, engineering, or math programs at leading universities. Our robot this year is named Mu in honor of CougarTech’s twelfth year as a team since Mu is the twelfth letter of the Greek alphabet. For the purpose of this year’s games, Mu uses an elevator system to raise power cubes to a scale, arms to pick up cubes for transferring them into vaults for new powers, exchanging, as well as being able to climb. Our design process focused on determining skills, Mu needed in order to be successful in the specific parts of the game. Team leads assigned separate groups to work on each part for maximum efficiency, each group focused on specific aspects such as climbing, defensive maneuvers, also picking up and scoring with power cubes. Each group had to come up with specific configurations for their part, then the groups came together to build the robot as well as create a practice bot we could test. Our widely adept team was broken up randomly as to achieve an advantageous spread of minds throughout the groups. Mu is an excellent example of CougarTech’s combined capabilities. After the 2017 kickoff at Spencerport High School, we started to create ideas left and right. It took us about one week to finalize a design and even after that, we were still making changes as we went along. Soon after our design process was complete, we broke off into our seperate sub-teams and we got to work right away. Our first regional was not the best because we came across some problems that set us back during competition; but we didn't let those problems shut us down. At the end of the Finger Lakes Regional we finished 40th. That was not the best that we have done, but our team spirit was very strong. Two weeks later, we boarded a bus and began our journey to Cleveland for the Buckeye Regional. We arrived at the second regional with a lot of energy. The entire team had a winning spirit. Overall we finished fifteenth, and we got picked by the third seeded alliance and from there our spirit level soared to new heights. The first playoff match we set a new event high score, 445. After that, we lost to the second seeded alliance and in an instant we were out. We didn't let that get us down, our team was still very pumped up with lots of energy because of the amazing progress we made. At the end of the competition, during the award ceremony, we were very excited to win the Gracious Professionalism and Industrial Safety awards. Overall, our season was amazing. We started off slow and went out with a bang. After the season kick off on January 9, CougarTech went straight to work. By dividing into developmental subsets and running human-based trials, we were able to start developing potential designs immediately. Because of this new efficiency combined with long hours in the shop, we felt ready to take on Toronto. 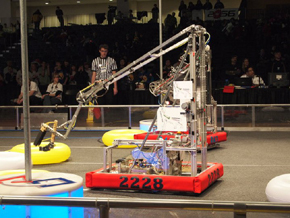 For our first regional, CougarTech travelled to the greater Toronto East regional in Canada. Although we were not selected for an alliance, we finished the qualifying rounds at a strong 17th place. During qualifying rounds, our safety co-captain was given the UL Safety Star of the Day award for her outstanding efforts in educating others about safety and its importance. Later, during the final closing ceremonies, we received two more awards. The first award, Gracious Professionalism, was awarded to CougarTech for our continued commitment to the mission of FIRST, and our commitment to help others, even in the face of defeat. For the second award, we won the Industrial Safety award, further highlighting our exceptional program and commitment to safety. A short time later, CougarTech boarded a bus and traveled to the Finger Lakes Regional, located at RIT. Again competing with highly skilled teams, we fought fiercely for 22nd place. During the qualifying matches, our safety captain was recognized with a Safety Star of the Day for his involvement in overall safety and wellbeing. To end an accomplished season, our Business and Marketing team was awarded the Entrepreneurship Award to highlight our comprehensive approach to funding our team. At the end, we were able to take away teamwork, compassion, and most of all, a love for competition that will always be to our benefit. After redesigning our build process, we knew that 2015 was going to be a big year. Even though the team had lost over half of its members from the previous year, we were determined to build as good a robot as any. The team’s robot used an elevator mechanism to pick up and stack totes on top of each other. The robot could also pick up recycling bins and stack them on top of the totes as well. For our first regional competition, we went up north to Toronto for the Toronto East Regional Competition. At this regional we placed 4th out of 47 teams and were captains of the alliance which ranked 3rd overall. While competing in this regional, we secured the Industrial Design Award and were runner-up to the Industrial Safety Award. We also competed in the Finger Lakes Regional at RIT, as we usually do, placing 5th out of 45 teams and were awards the Judges’ Award and, again, were runner-up for the Industrial Safety Award. After two successful regionals, we went on to compete in the FIRST Championship in St. Louis, MO, performing well and gaining some valuable information from other teams. Overall, 2015 proved to be a great year. 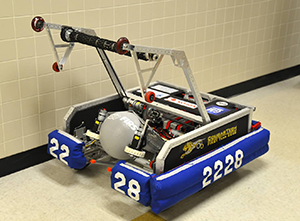 CougarTech had big expectations going into the 2014 season, including both in the competitive arena, and in the community. 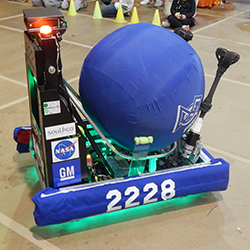 The team’s 2014 robot was capable of picking up balls from the ground as well as catching them. It used an ultrasonic sensor to find the distance from the goal and make an accurate shot. Also, the robot could both precisely shoot in the large goals and over the truss. CougarTech competed at the first-ever New York Tech Valley Regional, hosted at Rensselaer Polytechnic Institute, and finished in 16th place out of 38 teams. We, as usual, competed at the Finger Lakes Regional, hosted by the Rochester Institute of Technology, and finished 8th out of 49 team. At the Finger Lakes Regional, Team 2228 was the captain of the 6th alliance and make it to the semifinals. CougarTech received two awards in 2014, both were at the Finger Lakes Regional. The first award was the Excellence in Engineering Award sponsored by Delphi, which celebrates an elegant and advantageous machine feature. The second award was not a team award, but an individual award, going to Peter Carosa for being named as a FIRST Dean’s List Award Finalist. He then represented our team at the 2014 World Championship in St. Louis, MO. 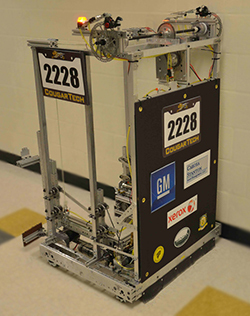 CougarTech maintained a strong presence in 2013, both on and off the field. 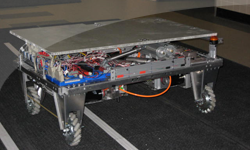 Our disc slinging robot achieved reliability in both disc slinging and pyramid climbing. 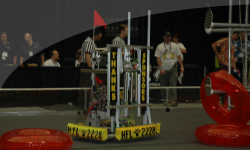 Able to score the flying discs into the high goal during the round, the robot would lift itself onto the lowest rung of the pyramid during the final seconds of each match. We again competed at the local RIT Finger Lakes Regional and the Buckeye Regional in Cleveland, Ohio. During the Buckeye Regional, CougarTech performed well enough to become an alliance leader, making it into the quarter-finals. The 2012 season went particularly well for CougarTech. Our team consisted of 41 members. This year our team competed at two regionals, the RIT Finger Lakes Regional and the Buckeye Regional, which was achieved through a record in corporate sponsorship. At the RIT Finger Lakes Regional, we won the Entrepreneurship Award sponsored by Kleiner Perkins Caufield & Byers and Excellence in Website Award. The highly reliable autonomous scoring helped us be alliance captains at both regionals. Additionally, we won the Industrial Safety Award sponsored by Underwriters Laboratories at the Buckeye Regional, something we had worked particularly hard for. 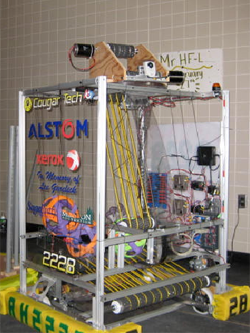 After the team's 2011 financial crisis, CougarTech made a plan to get more sponsors. Our plan consisted of finding a mentor who specializes in corporate sponsorship, having students give presentations to local companies, and asking our mentors to approach their management. Our plan was successfully executed and we raised $20,000 to ensure the continuation of our team. Our 2011 competition season was incredibly successful. We placed 7th out of 44 teams at the Finger Lakes Regional at RIT. The mini-bot built in conjunction with the Rush-Henrietta First Tech. Challenge team was crucial to our success, and helped up to win the Coopertition Award. Although we were unable to attend a second regional, we devised a business plan to improve our financial situation. This plan won us the Entrepreneurship Award, sponsored by Kleiner Perkins Caufield & Byers. Of our graduating team members, the majority headed off to college, majoring in STEM programs. The 2010 season saw the loss of our lead sponsor, Alstom, a severe blow to the financial security of the team. Fortunately we received the continued support of Xerox, along with new support from Forsythe. We also earned the NASA grant, which allowed us to travel to Raleigh to attend their regional. We were semi-finalists in Raleigh and we attended the Finger Lakes Regional for our fourth consecutive year. We also continued the partnership with the students from R-H, who formed a rookie FTC team that year in the fall. 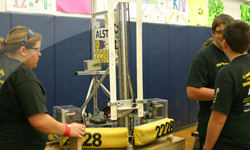 In the 2009 season, Team 1930, The Comets of Rush Henrietta, New York found itself without the means to continue as a FIRST robotics team. Losing the team was devastating for its most dedicated members; the team was the school's pride and joy, its symbol of technological innovation and scholarship. The school system could not give any assistance, and they had almost no resources to draw upon in their desperation. Early in November of 2008, members of former team 1930 came to HF-L to ask if there was any possibility of becoming part of team 2228. Without hesitation, the team unanimously voted to graciously accept seven complete strangers from R-H to their team. Since then, this relationship has become well cultivated. Our achievements for that year included advancing to the quarter-finals at the Finger Lakes Regional. We also participated in the Hartford regional. We also picked up Parsons Engineering as a sponsor. That year we received a generous donation from the Garelick family in memory of Lee Garelick, an important patron to the Rush-Henrietta team. In the 2008 season, our most notable achievements were made in the Ohio Buckeye Regional where we made it all the way to the finals. We also participated in the Finger Lakes regional. Our retention rate for that year was ninety five percent, which we saw as a great achievement for a second year team. 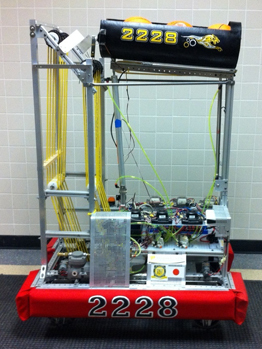 In our rookie year, Team 2228 won the FIRST Rookie All Star Award and the Highest Rookie Seed Award. This earned us a trip to the national competition in Atlanta, which proved to be a fantastic bonding experience for the team. Our rookie year proved to be good competition experience as well as a team building one.